Last summer I blogged about amplified events and using this blog for engagement, which is a topic I returned to for the recent Web 2.0 guidelines crowdsourcing experiment. 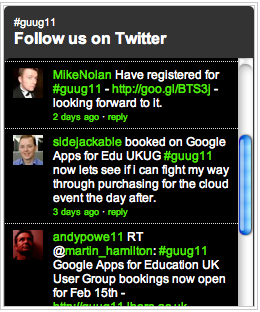 I've not had an opportunity until lately to try putting together an amplified event, but this has now presented itself in the form of the first Google Apps for Education UK User Group meeting. We're hosting this at Loughborough's Holywell Park Conference Centre next month, back to back with the UCISA Cloud Computing Seminar. We have been very successful with our Google Apps domain for students and alumni, which now has over 12,000 regular users of Google Docs, out of our ~18,000 undergraduates and taught course postgraduates - and near ubiquitous usage of Google Mail and Calendar. This year we will be looking at the potential of the Google tools for staff, where the key questions are around topics such as external collaboration. I've already had some interesting discussions with academics about using the Google tools for collaborative projects and online surveys. It's clear that there is also a lot of potential where workshops and conferences are concerned. Choose a memorable hash tag for the event - checking that it's not already in widespread use. In this case I have chosen #guug11, which isn't short for anything specific but resonates nicely. Pick an out-of-band communication channel for people to discuss event related stuff. Right now Twitter is the clear choice for this. Use Web 2.0 tools and techniques to ensure that the event website is dynamic and largely "looks after itself", rather than being just a static set of pages reliant on the organizer to update. Some techniques that I have used for the Google event are detailed below. I will also look at some of the nuances and wrinkles associated with this approach, as there are some pitfalls and traps for the unwary. The website for the Google event is hosted on Google Sites, under our nascent staff Google Apps domain. Google Sites is a very nice tool in itself, making it trivial to construct impressive websites and pull in live content from elsewhere in the Google ecosystem. People who chose to appear on the publicly viewable list of delegates have their details automatically extracted via a Google Docs spreadsheet, as shown below (hit reload if you just see "#VALUE!" here - it doesn't always work first time). The actual event registration is done via a Google Docs form which feeds into a private spreadsheet, as discussed in the final section of this post. This tries to total the cells in column "M" from the Google Docs spreadsheet with ID "tOKXCOkzDzXiRk241EWPu3Q" where the cell value is equal to the value of cell A2 in the current spreadsheet, e.g. cell A2 might be "Night of 14th Feb". The key point to note here is that a publicly viewable spreadsheet is generated from a subset of the data in a private spreadsheet. As Tony Hirst notes, Google's Visualization API effectively lets you carry out SQL queries using Google Docs spreadsheets as your underlying database. Finally, it should be noted that all of the above content apart from the Twitter widget is actually embedded "live" into this blog post, rather than being snapshots of the data on the website. And in the spirit of open data, the underlying Google Docs spreadsheets derived from the registration data (but not the full registration data itself!) are available as a tab on the embedded material above. Whilst Google are providing an excellent set of tools at a bargain price (== free for educational use! ), there are inevitably some areas where the cracks show. I'll outline them here for the benefit of anyone else trying to follow a similar approach - but do be sure to check the datestamp on this post before leaping to any conclusions, as that this is an area that is changing rapidly. I expect that most if not all of the points that follow will be addressed in the next few months. For many purposes we would want to associate a Google Sites website with a "vanity" domain name - this doesn't seem to be possible at present, although you can root your instance of Google Sites under an institutional domain name such as sites.lboro.ac.uk. I have cheated and created a virtual host on one of our web servers for http://guug11.lboro.ac.uk, that redirects to the Google Sites service. If you enable SSL for your domain to protect session cookies from sniffers, then it's not possible to use an institutional domain name for your instance of Google Sites, Docs, Calendar etc. Ideally you would be able to upload your own SSL certificate or buy one through Google, then add the appropriate A records or CNAMEs to your DNS for the Google hosts - as with the unencrypted version of the service. Enabling SSL is a global setting which is inherited by other services. Consequently all web content served up by Google Sites will be done via SSL. For Internet Explorer users (there are still some around) this is likely to result in a warning message about a page which contains a mixture of encrypted and unencrypted content, e.g. embedded Twitter widgets. Unfortunately the Internet Explorer problem applies to the embedding HTML code generated by Google's own tools, e.g. YouTube video and Google Docs spreadsheets. In some cases the underlying Google service is accessible via SSL simply by changing the URL in the embed code, but this doesn't always apply. The Google Docs form tool is a truly brilliant creation, but people often want to embed a subset of the form submissions - e.g. in our case we would like to omit responses containing personal information such as email addresses and phone numbers. As described above, it's possible to create a new spreadsheet that includes a subset of the data from an existing one, essentially replicating the summary stats normally gathered by the form. But, the mechanism for doing this is not obvious and it is tricky to get right. Finally, and particularly around the areas of events, online journals, project collaboration etc - it's great that you can share the likes of forms, documents, calendars and websites - and that there are a range of options for sharing them. However, a Google Account (seemingly with a Gmail address associated with it) is required for any sign-in based sharing. Hopefully we will be able to use OpenIDs for sharing soon too, although as Byrne Reese notes, we may need email address based Open IDs for this to really work. I found Eventbrite to be very good at handling registrations. It's free as long as you don't charge delegates. FWIW I was originally aiming to use Eventbrite for this, but then sussed that I could do the live content tricks on the website if I used Google Docs for the registration form. Nice site and good demo of tools.Looking foward to the event Personally i'd prefer to see shibboleth/UKfederation based sharing rather than openID. UK academic community has much higher access to shibboleth IDs. It gets much worse, though, in that there are so many federations doing essentially the same thing in slightly different ways, and the odd one doing something wholly different (e.g. single IdP for everyone). In my rose tinted view of how this should work there is either one federation, or zero because federations are no longer necessary. Anyway, the real elephant in the room is Facebook Connect! It turns out that there are some limitations in the "importrange" function which mean that it breaks down with a large spreadsheet. I've replaced it with a short bit of Google App Script that should be a bit more robust. I also found a way of associating a vanity domain (such as guug11.lboro.ac.uk) with a Google Sites site under a Google Apps domain. This setting is "Web Address Mapping", in the "General" category when you go to the "Manage Site" page. However, I think my comment about sitewide SSL settings interfering with vanity domains still holds. Will test this sometime when I get a spare moment! OK, so regarding vanity domains it transpires that I was wrong - this is actually handled quite nicely, and your Google Sites site gives every appearance of being hosted under your vanity domain.